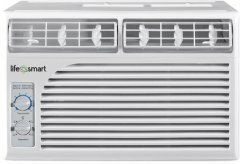 The AC-LS-WAC5M is the only Lifesmart air conditioner we have on file. Estimated cool area 150 Square feet. Also called Lifesmart 5000-BTU AC-LS-WAC5M, Cool-living LS-WAC5M.